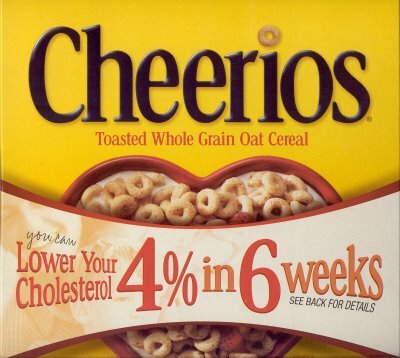 Cheerios claims to reduce cholesterol by 4% - yeah right! Hats of to the US Food and Drug Administration (FDA) for tackling breakfast cereal giant Cheerios on its bogus cholesterol reduction claims. The FDA is "in discussions" with Cheerios producer General Mills over its widely advertised claims that eating Cheerios can lower your cholesterol by 4% in six weeks. Fake claims like this have been banned under the Nutrition Labeling and Education Act for more than 10 years now. So well done to the FDA for finally having the gumption to take on the country's biggest violator. Last month it tackled another cereal offender, Kellog Frosted Mini-Wheats, over its claims that filling up with it's sugary product every morning made kids 20% more attentive than those who hadn't had breakfast. Bruce Silverglade, legal director of the Center for Science in the Public Interest interprets this as the new Obama administration, "signaling the rest of the industry that the agency is not going to let a big market leader get away with it and won't let anybody else get away, either". Cholesterol is very dangerous for the human health, so it's very important to try to lessen it's amount in the food we eat every day. Keep on writing other informative articles. Here's the nice writing service if you need any help. For the prevention of recurrent candidiasis and knowing the methods that how to treat that disease so come on my site. If any body badly affected from yeast infection and want to know how to release from that disease so visit my blog. I am sure that nowadays problems of cholesterol and obesity are very common. I hope your advice will be quite helpful for all people. I will definitely recommend your site to all my friends. Besides, you may use www.custom-paper-writing.org and avoid any paper troubles with writing new posts! Hello! How to complete my essay in time? They http://essay-mania.com will write your essay with all details, ideas by experienced academic writers this custom essay is a great support for writing your own paper. If perhaps I possibly could perform the actual miracle you need to do together with your weblogs. I've been attempting to create my personal dissertation however We obviously can't draw this away. It appears I'll once more possess to utilize a a lot when i had been staying away from this. I might want to thank you for the exertions you have made in composing this article. I am trusting the same best work from you later on also. The Poiz Residences and The Poiz Centre (formerly known as The Andrew Residences and The Andrew Village) is located in District 13 along Upper Serangoon Road and Meyappa Chettiar Road. Thank you for your question. First, even though I try to keep fit, I do not eat this kind of a breakfast, even sugar-free. I love good old cereal. I heard this kind of breakfast to work not the way many think it works. No weight loss is happening but see for yourself. Some just enjoy it because it is tasty and easy to make. when I tried to choose dissertation writers for me, I was lucky to find a truly excellent customer service and today I am happy to share with you my finding! Very well written post,you have done hard work in collecting data which is very good for writing an article. The post is about Tackling Cheerios' Bogus Cholesterol Claims.I have read this and i must share it with my friends. That's really good product for cholesterol. This product is very effectively. Cholesterol is very big problem most people but this cheerios is good for cholesterol. Nice story you share with us.I read it and share with my online friends. I will only say thankful to you for sharing this and I also like this website. I also wrote an article on a similar subject will find it at limo service Edmonton write what you think. write my research paper online some of people get the best thing and change into the people mind. You have raised an important issue..Thanks for sharing. I would like to read more current affairs from this blog..keep posting..
On this page you can read driving schools ny my interests, write something special. I love that Cheerios made with 100 percent natural whole grain oats. It's really important for me, 'cause i'm eating only healthy food. Don't want to write your essay? Come here paperswriter. Every student is looking to write queensland-assignment com books. But, no one have choice for write those educational reviews. That's why? We are interested to use these educational reviews for our new students. bettys beauty blog has been selling the best anti aging cream online, bettys-beauty-blog.com/beauty-products-online - Guide on Shopping for Beauty Products Online and Betty has tested all the products on herself. Find out how Bettys has improved her skin and wrinkles on her face! Well the leadership quality is very essential for achieving the dream of your childhood, But these skills are not to be inherited by itself, the person should learn and grow these Skills Of Leadership By himself and cherish it . I take my education in college very seriously. But I’m not one of those nerds thinking that there is nothing more important than assignments. I divide my homework into major and minor tasks. The first type I accomplish myself, and the minor assignments are usually tackled by online writers from custom essay service. I am really enjoying reading your well written articles. I think you spend numerous effort and time updating your site. awriter.orgI have bookmarked it and I am taking a look ahead to reading new articles. Very last calendar month that tackled another cereal culprit, kellog frosted mini wheats, in excess of their claims which filling up together with it can be sugary item each early morning built young children a lot more receptive than those that we had not experienced dinner. Your blog is very great and fascinating for students. You have distributed brilliant paper writing articles. Daily I search for best paper writing contents because i need someone to write my paper. This is beneficial to me and my close friends. I feel very happy to discover your paper writing site. I wondered why General Mills stopped claiming that Cheerios would lower cholesterol. Now I know. Except now they claim that people who eat more whole grains are slimmer than those who don't. There are no whole grains in Cheerios but most people won't stop to think about it and will infer that eating Cheerios will make them skinny. I,m so glad that finally someone is doing something about these false accusation with these large industry companies. How can eating high levels of suger (Kellog Frosted Mini-Wheats) be good you, specially for kids. I hope the Obama administration will hit hard on All bogus health claims. And implement the LAW on all the ceral companies and fast food industries! This has been a looooooong time coming. I visited the Cheerios website the other day and they had a lame defense of their ridiculous claim along the lines of, "it's been approved by the FDA for 12 years and on our box for two years". All that proves is that no one with any muscle has called them on their bluff until now. I hope this is a sign that the FDA is finally growing some teeth.